Ripe Banana is a good source of fiber, water soluble pectins, Vitamins C and B6, potassium and manganese. Banana also contains magnesium, folate and riboflavin, as well as several essential fatty acids. Banana’s fiber, folate, magnesium and potassium may help promote cardiovascular health while in certain individuals banana’s potassium may also help maintain bone health. Ripe Bananas may also help maintain normal blood sugar levels and contribute to kidney health. Fructooligosaccharides (FOS) are naturally occurring sugars that are indigestible by humans, and therefore calorie-free. 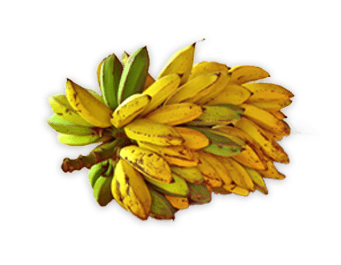 They are present in Banana and encourage the growth of “beneficial” microflora within the intestinal tract helping to support digestive vigor.